A potential energy source for life appears to be common on Jupiter's icy moon Europa, a new study suggests. An analysis of infrared observations of Europa revealed that hydrogen peroxide is abundant on the ice-covered Jovian moon. If the hydrogen peroxide finds a way beneath Europa's surface and mixes with the moon's liquid water ocean, it could be a vital energy source for any life that might exist there, scientists said. "Life as we know it needs liquid water, elements like carbon, nitrogen, phosphorus and sulfur, and it needs some form of chemical or light energy to get the business of life done," study leader Kevin Hand, of NASA's Jet Propulsion Laboratory in Pasadena, Calif., said in a statement. "Europa has the liquid water and elements, and we think that compounds like peroxide might be an important part of the energy requirement. The availability of oxidants like peroxide on Earth was a critical part of the rise of complex, multicellular life." The study found that the highest concentration of hydrogen peroxide occurs on the leading side of Europa as it orbits Jupiter. The ice in those regions is almost pure water, and not contaminated by sulfur like other parts of Europa, NASA officials said. Hydrogen peroxide is created on Europa due to the intense radiation bombardment of the moon's surface as it moves through Jupiter's powerful magnetic field. At its most concentrated, the chemical was found with a peroxide abundance of about 0.12 percent compared to water. That's about 20 times more diluted than the bottles of hydrogen peroxide for sale in drug stores on Earth, NASA officials said. 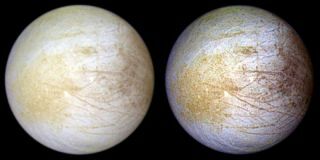 Hydrogen peroxide was first discovered on Europa by NASA's Galileo spacecraft, which studied Jupiter and its moons from 1995 to 2003. But Galileo's observations studied only a limited path of Europa. The new analysis covers a much broader region of Europa's surface. "The Galileo measurements gave us tantalizing hints of what might be happening all over the surface of Europa, and we've now been able to quantify that with our Keck telescope observations," Brown said. "What we still don't know is how the surface and the ocean mix, which would provide a mechanism for any life to use the peroxide." But the fact that so much peroxide exists on Europa is a boon for the potential habitability of the icy moon's water ocean. When mixed with water, peroxide releases oxygen. "At Europa, abundant compounds like peroxide could help to satisfy the chemical energy requirement needed for life within the ocean, if the peroxide is mixed into the ocean," Hand said. The research is detailed in a recent edition of the Astrophysical Journal Letters and was partially funded by NASA's Astrobiology Institute through its Icy Worlds team.